Our building day is approaching very fast–everything is finally happening on April 26th! We are very excited to finally get our plan into action. On April 26th, we are going to have a very long day of work. We start at 11, and go until about 7. We will also be having two BBQs–one for lunch and one for dinner. In the morning and early afternoon, we will be weeding, and clearing room for the building to happen. Then, when we are finished, we will begin the building of the garden boxes, and if we have time, the benches too. We are hoping that the building won’t go past 5:30, so that we can have time for our final BBQ, and clean-up. Sounds like you will have a long day of hard work, but I bet it will be so much fun to see your plan in action! 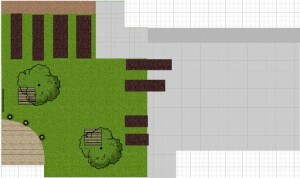 I like that you included benches so that the garden has multiple uses too. Good luck and have a fun day. Yes, it was a lot of work but it was such a fun day! Thanks! I hope that you’ll post pictures of your garden after it’s finished. I’m sure with the hard work you are putting in, it will run out great! Pictures are coming! Thanks, it really did run great. We did have pretty good weather..sunny and cloudy, and pretty warm! Hopefully you will get good weather so that you can start up your garden. We will put up some pictures soon…one tree has 5 types of apples and one has 4! Your garden sounds like such an exciting project! I can’t wait to see pictures. I have this great book about setting up a garden in a school that I bought at the United Nations in New York a few years ago. It doesn’t seem to be available through Amazon anymore unless you buy used copies. I found this link, though, and it appears they have the book in online format now. Perhaps this might come in handy for any questions you might have? Best of luck for a bountiful harvest very soon. That book sounds good..We’ll check out the link soon! Thanks so much. I just noticed you can download a .pdf of the book if you look for the link at the top right hand corner. The book is published by the FAO (Food and Agriculture Organization) of the UN, so a great find.